Accommodation in excess of 8,620 sq. ft.
A modern six bedroom house plus a three bedroom bungalow, an underground eight car garage, an office and further garages, approximately 3.5 acres and a swimming pool. The Orchard has over 8,600 sq. ft. of accommodation in the main house and bungalow. There are four separate reception rooms in the main house as well as an open plan kitchen/dining/family room on the ground floor and six bedrooms on the first floor all with an en suite bath or shower rooms. The accommodation has lots of natural light with many of the ground floor rooms being dual or triple aspect with windows and glazed double doors to the garden. The galleried landing has a large lantern roof which allows plenty of light into the central landing and entrance hall. As well as the main house there is a self-contained detached three bedroom bungalow and a separate barn. 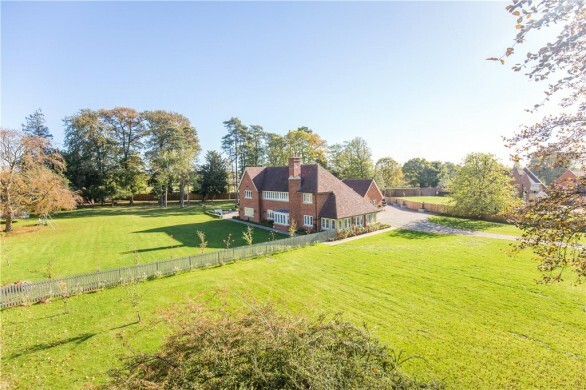 This comprises an office with a kitchen area, a double garage and workshop and a connecting glazed room which is currently used as a further double garage but which could alternatively be used as a garden room. 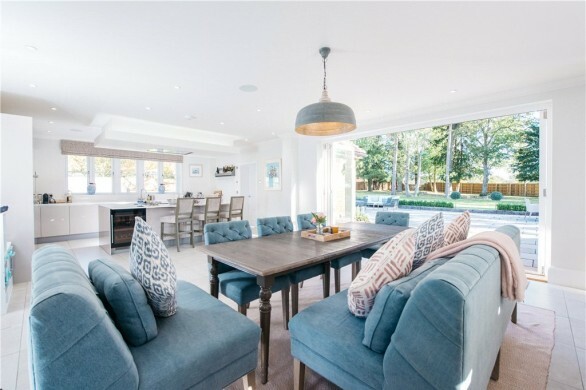 The Orchard has been finished to a high specification including a bespoke Sapele wood staircase, marble flooring with underfloor heating, marble worktops in the bathrooms and granite work surfaces in the kitchen. There is a cinema room which has a drop down screen, and a projector. The curtains and lights are Lutron controlled with numerous mood settings. The whole property is alarmed and monitored by CCTV. The electric video entry and CCTV systems can be monitored via mobile phone. The underground eight car garage and the double garage/workshop both have specialist R-tile garage flooring by R-Tek and both also have a range of Dura cabinets which are available subject to separate negotiation. The office has been wired for high speed broadband which also covers the main house and bungalow. Part obscure glazed double doors open into the front porch which has windows to both sides with built-in storage below. Further glazed double doors lead to the entrance reception hallway which has a butterfly staircase to the first floor and marble flooring with underfloor heating. This flooring continues throughout the ground floor apart from the drawing room which is carpeted. The cloakroom has a WC, a wash basin with a mixer tap over and an obscure glazed window to the front. The sitting room and dining room both have windows to the front and glazed double doors to the sides of the property. The triple aspect drawing room has a feature fireplace with an inset multi-fuel burning stove with a marble surround and hearth. There are glazed double doors to the front and rear. The cinema room has windows to the side, front and rear, together with glazed double doors to the front and rear. The kitchen has a range of fitted wall and base level units with granite worktops and splashbacks over. There is an inset ceramic butler sink with a mixer tap over. Integrated appliances include double ovens, an induction hob, two dishwashers, a fridge and a freezer. A separate inset ceramic sink has a mixer tap over. There are windows to the side and rear. The dining area has a granite table with space to seat at least eight and double doors to the rear pool area. The family area has a further set of double doors to the side. The utility room has a range of fitted wall and base level units with granite worktops over and splashbacks. There is an inset stainless steel sink with a mixer tap over, together with space and plumbing for a washing machine and a tumble dryer. There is a further built-in fridge and freezer. The galleried landing has a lantern roof. The master bedroom has windows to the rear and glazed doors to a breakfast balcony, which overlooks the gardens and golf course beyond. The walk-in dressing room has a range of built-in wardrobes and storage. The en suite has a multi-jet spa sunken bath with a mixer tap and shower attachment over, an inset mirror with a media system, an enclosed double multi-jet shower cubicle, twin wash basins with mixer taps over, a WC, a bidet, a heated towel rail and an obscure window to the rear. Both guest bedrooms have dormer windows to the front and rear and are accessed via walk-through dressing areas with built-in wardrobes. The en suites both have enclosed shower cubicles, WCs, heated towel rails, wash basins with mixer taps over and skylights. Bedrooms four and five both have windows to the front and side, together with walk-in dressing rooms which have various built-in wardrobes and storage, and skylights. The en suites both have inset baths with mixer taps and shower attachments over, enclosed shower cubicles, WCs, wash basins with mixer taps over, heated towel rails and obscure windows to the front. Bedroom six has a window to the side. The en suite has a corner shower cubicle, a WC, a wash basin with a mixer tap over, a heated towel rail and obscure windows to the rear and side. The bungalow has air conditioning throughout. The part glazed front door, with obscure glazed windows to either side, opens into the entrance hall. The cloakroom has a WC, a wash basin with a mixer tap over and an obscure glazed window to the side. A built-in storage cupboards houses the water tank. The utility area has a fitted wall and base level unit with a worktop over and splashback. There is an inset stainless steel sink with a mixer tap over, together with space and plumbing for a washing machine and a tumble dryer. The kitchen has a range of fitted wall and base level units with granite worktops over and splashbacks, together with an oversized central island which incorporates a breakfast bar. There is an inset sink and drainer with a mixer tap over and a fitted waste disposal. Integrated appliances include a fridge, a freezer, an induction hob, a dishwasher, an oven and a microwave. There is a window to the front, together with glazed double doors to the side and rear. The master bedroom has a window to the side and glazed double doors to the rear. Bedroom two is a dual aspect room with windows to the side and front. Bedroom three has a window to the side. The family bathroom has an inset multi-jet spa bath with a mixer tap and separate shower attachment over. There is also an enclosed double shower cubicle with an oversized rainwater shower head and separate attachment, a WC, a wash basin with a mixer tap over, a heated towel rail and an obscure glazed window to the rear. The landscaped rear garden has a wraparound lawn with a variety of extensive paved patio seating areas. There is an outdoor heating swimming pool and a variety of store barns and pump houses. The feature pond has a bridge over with a sheltered seating area. To the front of the property, electric wrought iron double gates open to a block paved driveway leading to an underground eight bay garage which sits below the bungalow. There is an electric up and over door to the front and power and light are connected, together with a security alarm. The air conditioned detached weatherboard under slate barn has further garaging and a home office. Entrance is via a part glazed door into the office area which has a window to the side and sliding doors to the front. There is a fitted kitchen area which has a range of fitted wall and base units with granite worktops over and an inset sink with a mixer tap over. Integrated appliances include a fridge and a dishwasher. The cloakroom has a WC, a wash basin with a mixer tap over and an obscure glazed window to the rear. The show room has sliding doors to both the front and rear, together with skylights. The double garage has an electric up and over door to the front and a bank of free standing Dura units. There is a stainless steel sink with taps over.